The Summer issue of Washington Tasting Room Magazine contains an article I wrote titled, "Terroir: The Rocks of Walla Walla." Additionally, the May/June issue of Vineyard and Winery Management has an article I wrote titled, "Whither Washington whites?" discussing reasons for the general lack of focus on white wines in the state. 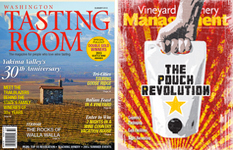 Finally, the June issue of Wine Enthusiast contains a series of wine reviews.